The Law Office of Jared A. Rose helps car accident victims in Kansas and Missouri. Car crashes are sudden and unexpected. During an accident, the last thing on your mind is a lawsuit. Afterwards some people feel like they can handle things on their own. But people who get a lawyer usually receive more compensation for their injuries than people who don’t. At the Law Office of Jared A. Rose, we handle car accident cases on a contingency fee basis. We cover all the costs of investigating and developing your case for trial. And if you don’t recover money for your claim, then you will not pay attorney’s fees to our firm. Remember that after an accident you aren’t just going up against the other driver, you are going up against their insurance company. Even if the other driver admits fault, the insurance company will try to pay you as little as possible to make you go away. 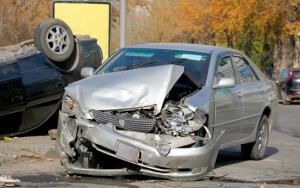 You will want an experienced car accident lawyer to help even the playing field. If you have been seriously injured in a car accident then your work and home life have probably been completely disrupted. You’ll be going through surgeries and rehab programs, and you will have huge medical bills that could impact your credit rating or even lead to bankruptcy. We have fought with and won cases against every major insurance company in Kansas City. If the other driver had no insurance at all, you may have a claim under your own policy for uninsured motorist coverage. If the other driver didn’t have enough car insurance coverage to cover your damages, you may have a claim for underinsured motorist coverage with your own insurance company. And you’ll want a lawyer to assist with those claims. You deserve compensation for your pain and suffering, your medical bills, your lost wages, and for the impact that this accident has had on your life. If you were injured in Kansas or Missouri, please call The Law Office of Jared A. Rose so that we can help. Our initial consultation is free and we will not take any fees unless you recover money for your claim. We have gotten more than $8 million in settlements and judgments for injured clients.